Special Issue on "Energy and Power Management for Electric Vehicles"
General Interest Paper by AWeifeng Liu, Yiyong Yang, Chuankun Han, Linhong Ji, and Jia Cheng, "Measuring System Design and Experimental Research on Electrostatic Attractive Force"
General Interest Paper by M. Amin Sabet, Behnam Ghavami, and Mohsen Raji, "GPU-Accelerated Soft Error Rate Analysis of Large-Scale Integrated Circuits"
Conference Report by aydeep Kulkarni and Thomas F. Wenisch, "Report on the 2018 IEEE/ACM International Symposium on Low Power Electronics and Design"
Conference Report by Yervant Zorian "The 10th China Test Conference"
This article targets at optimizing driving range and battery lifetime for EVs. The authors propose a scheme by which heating, ventilation, and air condition systems can be jointly optimized with driving routes while considering electric motors. read more. Charging plug-in electric vehicles (PEVs) lead to gradual degradation of battery capacity and, hence, pose a hidden cost for each charge cycle. read more. This article focuses on reducing a charging cost for electric vehicles (EVs). A charging strategy is proposed to minimize the charging cost of EVs within the charging station constraints. read more. This article discusses the insights for design and implementation of onboard PV systems for electrical vehicles. It proposes novel and efficient approaches to maximize the performance of onboard PV systems. The proposed method has been extensively validated for industrial applications. read more. 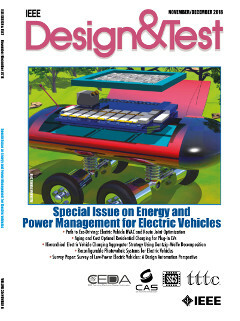 The survey of the guest editors provides a comprehensive introduction to the design process of electric vehicles. Relevant topics such as the modeling of efficiency of the propulsion engine, optimization of the propulsion engine, runtime driving management, battery systems, and charging are introduced and provide the necessary knowledge to understand state-of-the-art research of this special issue... read more. • Roundtable: Machine Learning for Embedded Systems: Hype or Lasting Impact?